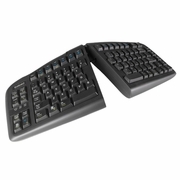 Welcome to comfort 2.0 A proven design and years of longevity make the Goldtouch V2 Adjustable Keyboard a leading recommendation among Risk Managers, Certified Professional Ergonomists, Physical Therapists and Occupational Therapists. A key component of the Goldtouch Keyboard is the patented ball and lever locking design, which allows the keyboard to uniquely adjust to fit a range of body types, not just an average. It is the only keyboard designed to properly straighten the wrists and arms, which aligning your shoulders to achieve a neutral typing posture. It's time to experience the comfort of a keyboard that fits! Adjustability: 0"-30" adjustment in the horizontal plan, combined with 0"-30" adjustment of vertical tenting to help straighten your hands, wrists, shoulders and back. Soft key touch, low activation force and full key travel distance provides keying comfort and reduces risk from bottoming out when typing. Compatible with Windows 2000, XP, Vista and Windows 7, and Mac OS 10.4, and newer. Disclaimers: Do Not Plug your USB Goldtouch Keyboard into the USB Keypad. Your PC will not recognize it.